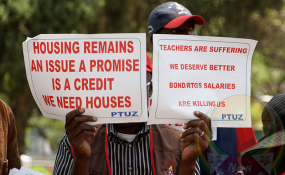 In a joint statement, the Zimbabwe Teachers Association (ZIMTA) and the Progressive Teachers Union of Zimbabwe (PTUZ) threatened legal action over what they said was government's plot to stall their job action. "At least 80% of our members heeded the call to withdraw their labour since Tuesday 5th February 2019. In some institutions, school heads, ministry functionaries, security agents and political activists have been harassing our members who are legally taking part in the strike action. "We also note that government has not positively responded to our call for an improvement into our members' working conditions and remuneration," said the two biggest teacher representative groups in the country. "The numbers have actually increased since yesterday (Tuesday)," Majongwe said. "ARTUZ notes that the State has deployed members of the Police Internal Security Intelligence (PISI) to harass school leaders. "The PISI officers are sending messages to school heads demanding statistics and threatening the same heads. One headmaster in Silobela had to offer $20 in bond notes to try to bribe teachers to come to work. "ARTUZ is in possession of the messages from PISI," the union said in a statement Wednesday. "We therefore declare that the industrial action intensifies tomorrow, the 8th of February 2019 and we call upon our members not to set foot at schools," the unions added. The unions called on their members to report "any form of intimidation" warning the government to refrain from harassing their members threatening legal action if it continues.